My 15 minutes Of Fame (but more like 15 seconds).. Article that came out in the Norman Transcript last Monday. So weird to read about yourself! 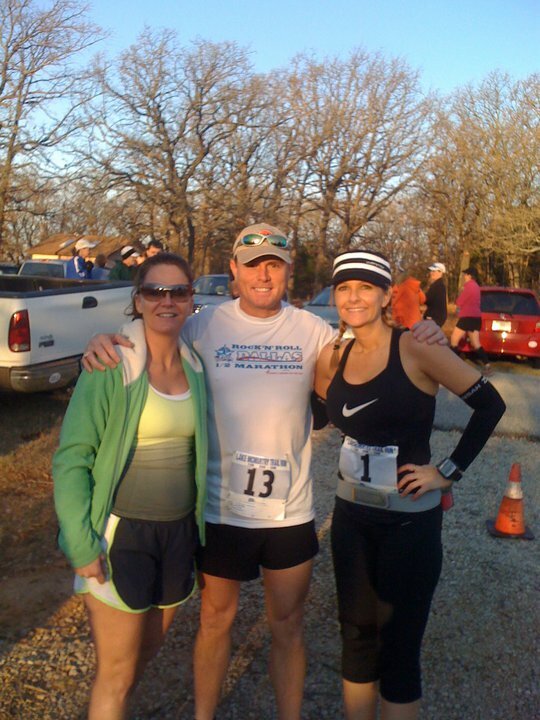 Lake McMurtry Trail Race was the perfect race to choose for my first 50k. Fairly flat with no major climbs and this race is laid out perfectly for crew support. It's a figure 8 with the start/finish smack dab in the center. Runners tackle the north loop first, then come through the start/finish area before moving on to the south loop, then repeat. Which means I got to see my crew/kids 3 different times during the race. They always had fresh bottles of Accelerade waiting for me as well as gels, S! caps and hugs. My friends Holly, Jason and Mike drove all the way up from Rockwall, TX to participate in the race. Holly ran the 12k and Mike ran the 50k. My gorgeous daughter-in-law April ran her first 12k and did great! So proud of her! The day got off to a rough start when our GPS decided that Lake McMurtry was a pasture about 20 miles away from where it actually is. This took us off course and put us pretty close to being late for the race. Eek! We arrived with about 15 minutes to spare and hurriedly picked up our packets, pinned on numbers, filled bottles and tried to calm down a bit. I was bib #1!!! That was fun! : ) Not an ideal start to a race, and it took me a few miles to relax and settle in. Loop 1- First few miles went by quickly. The weather was perfect! 52 degrees with a light breeze. I had on arm warmers but these came off at mile 6. Gorgeous course. Even got to jump the "Leap O' Doom"! I got to run and chat with some of the wonderful TATURS during this loop. First I ran with Kathy Hoover for about a mile. She is an accomplished and very nice ultrarunner that is recovering from Rouge Orleans right now where she ran 126.2 miles. Amazing! Then Joel hung back to wait on me so we could run together for awhile. Thanks Joel, I enjoyed the conversation!! 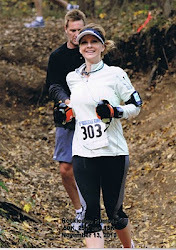 He's the race director for Do-Wacka-Do trail run and such a nice guy. One rookie mistake made itself evident right from the start. I had put all my S! caps and Ibuprofen into a hard plastic small bottle in my fuel belt pocket. The rattling was driving me crazy! I ended up just dumping everything in my fuel belt pocket and holding the plastic bottle. I'll have to figure something out next race because all of the pills melted and when I later would reach into the pocket my hand would come out covered in salt. Loop 2-So I finished the first loop and came into the start/finish area where my kids had fresh bottles waiting for me. It's such a good feeling to get to see your family after each loop and really gives you something to look forward to. I started the south loop which is my favorite because you are running beside the lake most of the time and get a good breeze off of the lake. Very pretty! So far uneventful..I'm running strong and feeling good. These trails were packed with people since the 25k and 12k was out there now as well. Everyone was friendly and there were lots of "good job" encouragements. Back into the start area where I sat down a minute to put more sport slick on my feet since I had several hot spots developing. Loop 3-It was kinda hard to get back on my feet and get out there. My family was sitting in the grass and a part of me just wanted to stay and kick back with them. It was really starting to heat up...I think it was about 80 degrees outside at this point. I started getting nauseous and when I made it to the OTRA aid station at mile 20 they suggested I drink some flat coke to settle my stomach. It worked! I also put some ice in my hat and in my sports bra. Cooling down my core did the trick and I started feeling much better. Loop 4-The temperature was now mid 80's and I was hurting. Would run for a minute or two and my heart would be pounding hard and I couldn't catch my breath. Jason ran part of this loop with me and noticed I wasn't sweating and was getting cold chills. He kept reminding me to drink, drink, drink. At the aid station I re-filled my bottles with cold water and they gave me some ice for my hat. I ran all I could of this last loop but it was rough. I made the stupid mistake at mile 28 of stating outloud "that I had not fallen one time". So of course... two miles later, I fell! One mile from the finish line. ; ) Tripped over a root while going down a small hill but no injuries and now I could smell the finish line so I picked up the pace a little bit. My original goal was 6:30 but I slowed so much with the heat on the last 15 miles that I was just wanting to come in under 7:00. I popped out of the woods and saw the start/finish area in the distance and looked at my watch. 6:55! I could just make it. I went through the last bit of parking area, then trees and then up the staircase finish to the finish line. 6:57:40! I was so relieved and happy to be done. And somehow I even got 3rd female overall. What a wonderful, memorable day. I will remember it forever! Mike got 5th overall male in the 50k, way to go! Thanks to all my friends for their support and being there to cheer me on and encourage me...I am a lucky girl to have you! Special thanks to Holly...girl, you are my rock! And thanks Peggy, Melissa, Nancy and all of my OTRA friends for inspiring me and making me realize I can do more than I think I can. The TATURS did an awesome job as always with this race. Exceptional organization, volunteers, food and course marking. Thanks TATURS!! !